Friday was my first day of no classes, as the teaching semester officially came to an end. My brain had pretty much imploded. I knew there was marking ahead, but first there was complete blankness. There was a meal to cook, and I had not a shred of inspiration. I just knew that whatever it was, it was going to be comfort food. So I asked Dave. Fish, he said. The fish, bay leaves, cloves and leek heating in the milk. Easy, I thought. 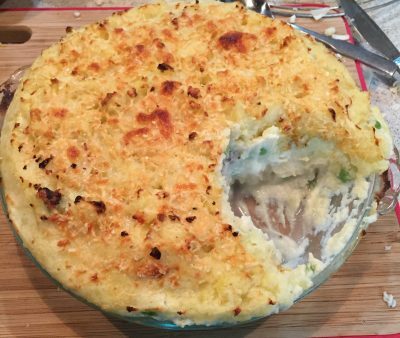 Fish + comfort food = fish pie. The only real query for me was the white sauce. Once you top the pie with mashed potatoes and cheese and then fill it with thick white sauce, it seemed like there wasn’t much healthy left. I don’t need a lot of healthy stuff in my comfort food, but I do need some. I decided I could add some cauliflower and some peas and maybe that would help. But then I spoke to the magnificently inspirational Kirsty and Lachie at Obelix & Co and they handed me the solution. I mentioned adding some pieces of cauliflower and cooking it in the same milk as the fish, and thank heavens they misunderstood me. Oh, we did that last week, they said. Cook the cauli in the milk, then blend it up and use it in place of the white sauce and it’s delicious. Only as as much of the milk as you need to make it useable. Perfect. And I will be forever grateful because while it was in fact completely delicious, it tasted exactly like a thick white sauce and it was all vegetables. Best of all: Dave loved it. Cook three large potatoes, then mash with some butter and milk and salt. Let cool. Hard boil three eggs, peel and let cool (the eggs are optional). 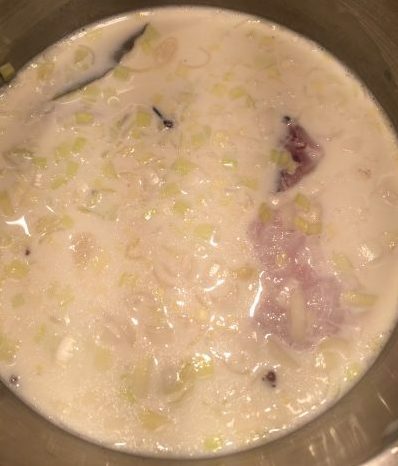 Take about a litre of milk and put it in a saucepan with a couple of bay leaves, a couple of cloves and some chopped leeks. The pureed cauliflower makes for a fantastic thick sauce for the fish pie, and it tastes just like a great white sauce. Add in about 650g-750g white fish – I had a piece of ling and apiece of warehou – and simmer very gently in the milk for 8-10 mins until just cooked. Remove the fish and leeks from the milk and flake/slice the fish flesh into pieces. Chop up one whole cauliflower, add the florets and chopped stem to that milk and cook gently 10-12 minutes. Remove from the milk, allow to cool slightly, and put in a blender. Add just enough milk from the saucepan to make it blend easily. I did mine in two batches with about ½ cup of the milk in each. But add only a small amount at a time to get the consistency you want. Add salt and pepper. If you want fresh peas as well, as I did, cook them for a couple minutes first. Assemble. Get a pie dish and add in the fish, the cauliflower puree, the quartered eggs and the peas. Mix it around. Top with mash. Top that with grated cheese. Put in a 180C oven for about 30 minutes, until the top is browned nicely. Use the griller if it’s lagging. Verdict: Comfort food plus! Dave loved it, and the remainder tasted even better the next day. Sounds really yummy! Great for cold winters night! Get Nick on to it.